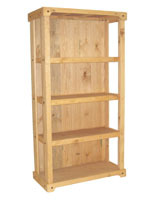 This five shelf wooden display provides book storage or a rack to showcase children’s, home, or retail merchandise neatly. 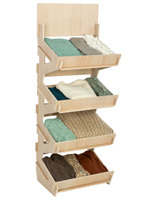 Stock each spacious tier with a variety of items ranging in height up to 10.75”h. 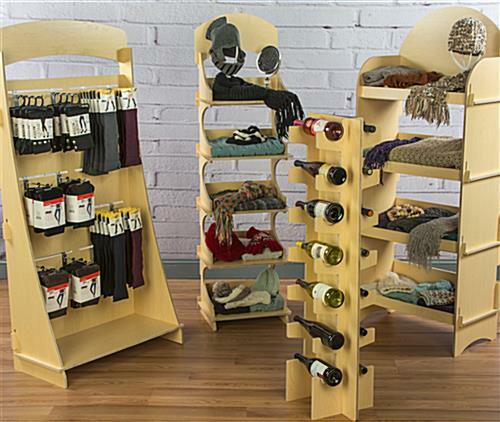 A knock down design allows each wooden display stand to be built in minutes without the use of hardware by connecting the interlocking boards together accordingly. 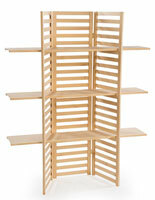 When not in use and when shipping, the book storage rack is packaged flat for optimal space saving capacity. Manufactured with an aspen lumber and weedtree plywood core, these floor standing units are durable and completed with a melamine coating. 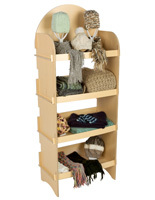 Ideal for home products, retail stores, craft fairs, and children’s outlets, each wooden display with a neutral finish provides a shelving stand suitable for any environment. Please Note: Due to the light plywood material, weight should be evenly distributed to help avoid the possibility of being knocked over. Also, a rubber mallet is needed for assembly and disassembly. 18.1" x 66.0" x 13.8"
15.5" x 10.8" x 12.8"
We were pleasantly surprised by how easy the units were to put together. We ordered 2 units. One was perfect. The second one didn't go together as smoothly and required a fair amount of muscle to get the shelves to slide in. We used a rubber mallet, as suggested. The bottom shelf on the one unit would not slide all the way in, even with hard hammering with a rubber mallet. That said, it wasn't noticeable and we were happy with the units overall. We were able to disassemble and will use them again. Overall they were 10x easier than Ikea units and came apart nicely for future use. Jenifer, thank you so much for taking the time to share your experience with us. 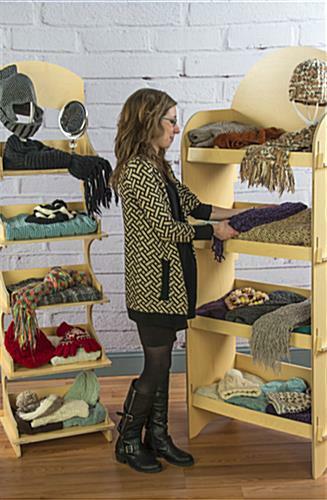 We're glad that these shelves proved to be easy-to-use, however we regret that you experienced difficulty getting one of the units to fit properly. We appreciate your feedback, and we'll certainly send this along to our product team for review. Our customer care team will follow up shortly to see if there's anything else we can do to assist. Thanks again! I use these to display product at expos and trade shows. They fit a surprisingly large amount of product and are very easy to assemble and break down. They very very sturdy for price. Can be painted, Have received numerous compliments from other show presenters. Highly recommend. We can see why you've gotten compliments, Victoria! These shelves look great! 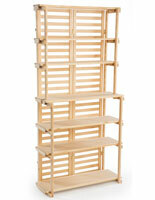 Excellent price..good value.....works as a display unit for me and is perfect......easy to assemble!